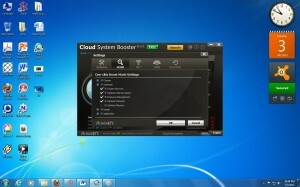 Anvisoft Corporation developed cloud system booster, to provide more powerful system cleaning effects. It includes four modules (Cleaner, Optimizer, Repair, and Application) to improve your PC performance through one click. It is called the one-click solution as one of the out-standing innovations for Cloud System Booster. Besides technically advancement, more can be listed as the Chameleon feature for personalized skin settings, friendly restore design, compact yet vivid GUI design, scheduled cleanup, etc. • Powerful Cleaner to Clean and Free up Disk: It could speed up pc by cleaning junk files like temps, cache to release more RAM memory and free up more disc space. • Disable Unneeded Services and Optimize PC : Cloud System Booster is able to optimize the Windows services, startup speed, resource management, network as well as the memory to speed up your slow machine. • One Click to Perform a Scan and Execute Through Cleaning and Fixing : It can fix registry errors, repairing common files extension, restoring privacy settings for better performance of your machine. • Typical Expert Mode for Professional PC Fix : It is friendly for your assistance to restore the system, manage the network, and run scheduled auto cleaning. • Chameleon – Change Skin with Simple Drop: Cloud System Booster pleases eyes with personalized style, never compromising to be commonplace in terms of not only system boosting performance but also special appearance, which is fulfilling the art of minimalism spiced with a little bit custom style. It needs 300 MHz processor or faster processor with 128 MB of RAM and 50 MB of free hard disk space. Operating system it supports are WinXP, WinVista, WinVista x64, Win7 x32, Win7 x64, Windows Vista Ultimate, Windows Vista Ultimate x64, Windows Vista Starter, Windows Vista Home Basic, Windows Vista Home Premium, Windows Vista Business. The PC optimization feature to enable peak system performance with speedy yet full cleaning make it more powerful and useful then CCleaner. IT comes with fast speed and comprehensive cleaning effects. Nice GUI Design for Easy Use as well as Vivid Function Presentation. It gives you the facility Personalize Your Taste with “Chameleon” Feature.